I’ve admired my Aunt Ruthanne’s consistent Wednesday blog updates for years now (A More Colorful Life! Erry Wednesday!). I don’t have any classes Wednesday afternoons this semester and, seeing as this is my third blog post in three Wednesdays, maybe I can follow her example and make Wednesday posts a regular thing. I won’t write much, though, because I’m trying to get as far ahead on NaNoWriMo as I can before the weekend. Here’s my progress graph! I’m at tomorrow’s goal, and I haven’t even started writing for today yet. I like how this book is coming together. I like the shape of it. I like the characters that are popping up out of the darkness. I like my ideas for the ending. The book feels complete, somehow, in a way my books rarely do at this stage in the writing. I know there are some threads that are missing, and I know I will have to go back to the beginning to weave a few new colors into the story, but I feel like I can hold the whole thing in my hands and I feel it is good. This feeling probably means I am in for a lot of surprises, but I’ll enjoy it while it’s here. I’m also having fun writing this book. I want this to be my job. How do I make this my job? Oh yeah. Keep writing. Good luck on NaNoWriMo and every other thing, you beautiful people, you. I finished NaNoWriMo today. I wrote my 50,000 words, and that’s a wrap for November. Here’s the graph; I even managed to stay pretty close to par all last week, despite traveling to Boston for a really lovely Thanksgiving dinner and weekend with cousins and friends. I have a lot more time to do creative work than I thought I did, but I need to be working hard every month of the year, not just November. Last year, in the wake of NaNoWriMo, I instigated a Sketch-a-Day challenge for December. I didn’t finish in time, but Ruthanne of A More Colorful Life sure did and I still think it’s a great idea. So this year, I’m doing it for real. If you need an artistic kick-in-the-pants, please join us! I’ll link to your blog if that’s where you’re posting December sketches, and if you’d like to join the online December Sketch-a-Day Challenge community, do a Facebook search for the group I made (it’s called December Sketch-a-Day Challenge) and request to join. The goal is 31 sketches, 31 days. The Sketch-a-Day Challenge is my big goal for December, but I don’t want to stop writing. I also don’t think I told you anything about my NaNoWriMo novel? It’s the self-indulgent telepathic dragon novel I never knew I had to write, and I don’t think I’m even fifty percent through the story at 50,000 hastily-written words. I have a lot of good stuff, especially good ideas, but a lot of those words are unusable and a lot of them will change once I figure out some answers to the Big Story Questions, and I’m finally at a place where I know which Big Story Questions I should ask. So I’m going to keep working on it. Most especially, I am going to take some time for outlining and researching and organizing—all the things I didn’t have time for during NaNoWriMo. 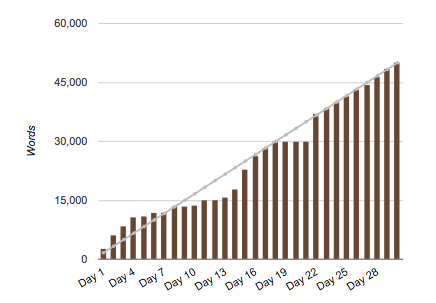 I know I need to do lots of non-word-count related work on the story, and I know my sketch challenge will take up the majority of my daily creative energy, so I am setting a very small writing goal of 500 words a day. This makes a total of 15,500 words for the month. That’s sure a significant drop from 50,000, and I’ll top it if I can, but I think 500 words and one sketch every day will be enough to be getting on with. And I think I’ll get tired. But I think I can do it. I was reading up on my Celtic Mythology, and I took a break to sketch an illustration I found in the book. 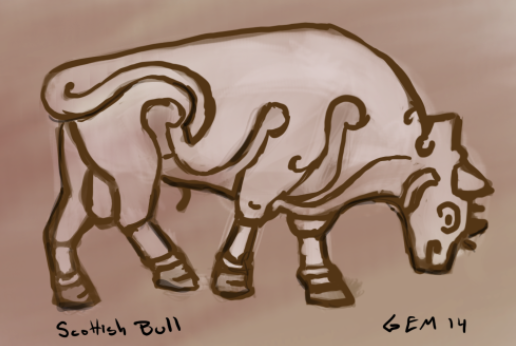 The following is a sketch of a drawing of a stone carving of a bull. According to Celtic Gods and Goddesses by R.J. Stewart, the original can be found in Burghead, Morayshire, Scotland (Stewart, 16). I’m working, but I’ve been really discouraged these past few days. Sometimes, it’s easier to focus on all the times you’ve quit and let things slide than it is to focus on all those other times you’ve started up again and worked your hardest. You start to recognize every platitude and new strategy as something you’ve said and tried before, as something that obviously didn’t work because here you are again, back to where you started. I also recognize that the negative energy doesn’t help, so I’ve been cleaning and organizing and seeking positive inspiration (thanks, Dad) and taking care of myself (12 mile bike ride, woo!) and working. Writing the words and making the pictures is, ultimately, the only way to prove to myself that I can. This is the 100th post on the Grace Makley Blog. We also had the two-year blog anniversary sometime last week. Neither of these strike me as especially significant, but it’s so hard to get anything done these days that I might as well celebrate small accomplishments. So I need a better space. Not necessarily my own solo space, but a space where I don’t need to feel self-conscious about the accouterments of my work, and a space where I don’t need to buy a drink to stay there. I actually had the possibility of an exciting opportunity that would solve my space problem and provide a fulfilling occupation and some extra income. I was hoping for it with all my hopes. It still may come through, but it’s looking less likely now, so I’m trying to move on to other solutions. I’m at a point where I’m ready to invest money in this, ready to make it happen—except, oh yeah, I’m also out of money! Not out out, but this business of cutting back to three days a week from four without an extra part-time job to fill in the cracks is starting to make itself known in the size of my bank statements. Even if I’m ready to shell out cash for some workspace and willing to make that investment, I just can’t afford it right now. This post is not supposed to be a downer! I’m just putting the problem out there to the universe. Acknowledging the issue in good faith, making my goals known, stating them so I can start working on them where I can. And hey, I grabbed an extra shift today. And I’ve got a job lined up painting a fence this summer. Not enough for rent on a studio space, but at least I’m getting by. And, oh yeah, the weather is beautiful. I’m biking places, and yesterday I ran the Back Cove Trail for the first time this year (over four miles, starting from my apartment). Today it reached 80º, and I have more energy after work than I’ve had in a long time. I’ve been trying to eat more fruit, and trying to at least go for walks when the weather is nice and I don’t feel up to running. I cleaned my room yesterday, and some harmony in my space makes me feel like I can breathe. Gotta wonder, sometimes, if Maine winters are really worth it. Do people in warmer climates feel this good all the time? Or are summers only so welcome in places like Maine and Michigan because we have endured the snow and cold and depression all winter long? As someone who would choose 90º F over 50ºF any day, I think I would like the opportunity, one of these years, to discover whether I would miss Maine winters if given the chance to do so. Hey internet! Do you have any advice for me on finding a studio I can afford in Portland, Maine? *The reference photo problem actually represents a solution to ANOTHER problem, the problem where I wasn’t using as many reference photos as I should because it’s hard to work ON the computer while looking at a photo that is also on the computer. So I started printing my photos! Now I can use my whole workspace for painting, but an 8″x10″ photo propped up beside my computer draws more attention than a few pixels taking up space on a screen. If you read my last post, you’ll recall that working from home is a real struggle for me, even if I’m working on the things I love and the things I want to be doing. This past weekend, I received an amazing gift of time and space that let me do more work in a few days than I’ve been able to do in a long time. There is a Franciscan Monastery and Guest House in Kennebunkport, Maine. It’s a ten-minute walk from the beach by road, and has beautiful, well-manicured grounds with walking trails through the woods to various shrines and down to the river near the mouth of the sea. 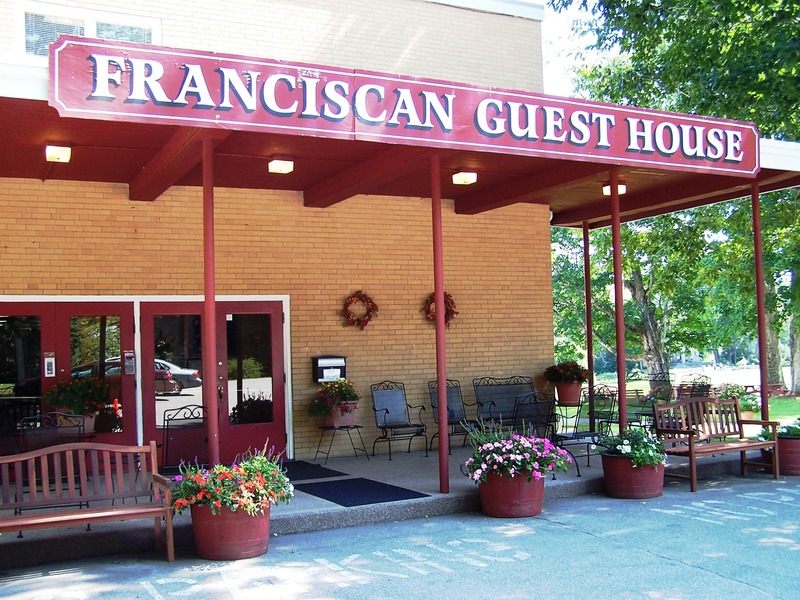 Every year before the tourist season begins, the Guest House hosts a retreat for the Secular Franciscans from the surrounding states. A Secular Franciscan is a Catholic who takes vows to follow in the footsteps of St. Francis—but Secular Franciscans aren’t monks, and they are allowed (and encouraged) to get married and live in the world. My parents are Secular Franciscans, and they’ve been taking me on this retreat since I was very, very small. When I was a kid, there were always older kids at the retreat who babysat and took care of the younger ones while our parents were at the retreat sessions. They took us to find tide-pools near the beach, brought us walking on the trails, and played frisbee and football with us on the lawn. We would sit at our own kids table at dinner, away from the adults, and steal second-helpings of pudding and third-helpings of very sweet iced tea. As we got older, we became the babysitters for the younger kids. Now I’m twenty or so years older than I was at my first retreat and my parents have aged accordingly, but my parents are still some of the youngest of the professed Secular Franciscans. There weren’t any young families with children at the retreat this weekend, and there weren’t any gaggles of young children running around the grounds the way we did when we were kids. Some of us still come back as adults, but this weekend all my childhood friends were busy (the baby of our old crew was attending his Junior year high school prom) and I was pretty much on my own. And, in terms of making art, that was exactly what I needed. While my parents went to the retreat sessions and spent their time in prayer and reflection, I went to a conference room on the third floor of the guest house and worked on a digital painting. Given large blocks of time to myself in a space without distractions, I was able to focus. I didn’t even have to worry about feeding myself, because the retreat included included bountiful and delicious home cooked meals served up three times a day. All I did on Saturday was eat, paint, eat, walk to the beach, paint, eat, walk to the beach, paint, spend some time with parents and dears friends, and sleep. I’m excited to show you the painting I was working on; it’s almost done! And of course we can’t be on retreat all the time, but sometimes time away from home shows us what we’re actually capable of when we don’t allow ourselves to be distracted. It was a good way to get back on track mentally and creatively, and I’m hoping to bring a little bit of quiet and focus with me as I travel through the weeks ahead. Have you had any retreat experiences that have allowed you to get more creative work done that you could do at home? Where do you go when you need to focus? It’s Thursday, and I have the day off. I was working Thursdays for several months, so I’m not used to this yet; it feels perilously like a Monday, and I have to keep reminding myself that the weekend will arrive sooner than I think. I’ll get some stuff done today. Important keeping-the-ship-afloat stuff like laundry, dishes, and tidying up the apartment, and I’ll do some writing and artwork on down the line as well. It’s hard for me to arrive at the place where the story and the canvas are the only things that matter. I get overwhelmed by everything else, and even within my own work I get overwhelmed by the choices. Should I write today, or paint? Is this editing the most important thing, or should I be writing new scenes? Should I be working on this painting that’s for improving my skills, or should I be taking reference photos and getting at the meat of a new illustration for the book? Decision-making is not my best skill, and it takes mental fortitude for me to even decide where to begin. And, if in addition to my pressing need to be someone who actually makes books and art rather than just talking about it all the time, the dishes also need doing, the floor needs vacuuming, the laundry needs putting away, it becomes even harder to choose my work over the work that keeps me happy and comfortable in my space. (I’m not a very good housekeeper, but I also get miserable when the house is a mess. It’s a constant battle, and the more I lose the less I feel like cleaning or doing anything.) This doesn’t mean I’ll actually do all the dishes instead of writing all the things when I get home from work; it just means I’ll feel bad about not doing either and watch another episode of House on Netflix. When I get home from work, I’m just too tired to prioritize and make decisions. I’m not too tired to do stuff—if there’s a scheduled event I’ll change into some nice clothes and go back out there—but if that stuff I’m trying to do is solely for my own happiness and personal improvement, then it becomes ridiculously hard to rally. Today, I’ll get to the art because I have time to do the dishes first and pack up the laundry. I’ll do some writing at the laundromat, and then I’ll come home and have a cup of tea and keep working. I have all day, so all the things I want to do are more spread out and a little less pressing. I’m not so overwhelmed by the stress of deciding which to tackle in an alarmingly short space of time. I’d rather work only on my days off than never work at all, but I think my task for the upcoming weeks is to find a way to remove the stress of decision-making from my process when I get home from work. To transition from day job to vocation in a way that doesn’t open the door for all the doubts and decisions that I just can’t deal with at that point in the day. Does anyone have any ideas? Do day-to-day decision hinder your workflow too? How you deal with the conflict between the creative and the mundane, when they’re both fighting for the same real estate in your 24-hour day?